The EconoNorse small test smelter takes its rough size and general operating characteristics from a nunber of Viking Age direct process bloomery smelters known from archaeology . The construction makes use of easily available modern materials, the design proven through practical experience. The rough form was initially developed in Fall of 2004 by members of the Dark Ages Re-Creation Company, with further refinements made in February of 2005 with guidance from Sauder / Williams / McCarthy. There is a relationship between smelter size and layout / ore type and size / charcoal size. 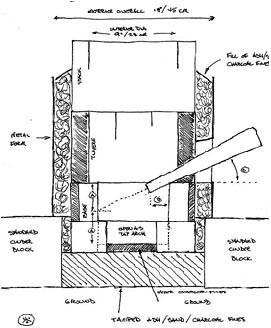 This guide describes the basic requirements for this specific furnace design. A simple view of the chemistry inside the furnace: Burning charcoal combines oxygen and carbon to produce hot carbon monoxide (CO) gas moving upwards. Iron oxide ore (Fe203) falls down and heats. The CO grabs the oxygen from the iron ore, producing CO2 and leaving small particles of metallic iron. These fall to the bottom of the furnace, collecting inside the developing bowl of glassy slag. The tuyere (air inlet) can be made of a simple length of 1 or 1.25" OD / 2.5 to 3 cm standard schedule 40 (or standard black threaded) steel pipe. It is placed on top of the first layer of bricks, in a small gap in the second layer set at 90 degrees to the tap arch. Above the tuyere, this gap should be filled with partial bricks and sealed with clay. The tuyere should protrude about 2" / 5 cm inside the smelter wall (B). It should be positioned on a slight down angle of roughly 20 - 25 degrees (C), and stabilized on spare bricks. The shape and quality of the bloom is greatly effected by the position of the tuyere.Finish the smelter by setting a base level using more charcoal fines. There should be a gap of roughly 15 cm / 3" below the centre point of the tuyere to this base. Air flow can be provided by a old vacuum cleaner blower or hand powered bellows (note that a hand rotary blower is not suitable). An electric blower should be equipped with either a sliding plate air valve or adjustable motor speed control. The air volumes required are considerable, and must be delivered both constantly and consistently over the entire smelt (4 - 6 hours). Air flow is a variable related to smelter diameter, and for this size will be approximately 600 - 800 l/min / 20 - 30 cubic feet / min. A huge quantity of regular hardwood charcoal will be consumed during the smelt, normally from 150 to 175 lbs / 70 - 75 kg. This should be broken up and then screened so that no pieces are larger than 1" / 2.5 cm dia. (walnut) or smaller than .5" / 1 cm (pea). The fines are retained and used as described. Iron ore may be any of a number of types. The key is that the iron content must be a minimum of 60 % to ensure success . Regardless of the source the iron ore must be pre roasted by heating to glowing (it will become magnetic after this step). The roasted ore must be crushed when cooled so that bulk of the particles run between rice grain and pea sized. It has been found that quenching the hot ore (rock or taconite) assists in this process. Typical yields are in the order of 20 - 35 %, so a volume of ore from 20 - 50 kg / 50 - 100 lbs should be prepared. The smelter should be preheated, starting with softwood splits and no air blast. The fire size plus air blast will be increased over about a one hour period. At this point the smelter is filled with unsorted charcoal, with graded fuel used thereafter. As the temperature inside the smelter increases, the consumption rate will also increase, and the position of the observable top to the burning zone will rise. The smelter will be approaching operating temperature when the time to consume a standard galvanized pail (at roughly 4 lbs / 1.75 kg) is about 8 minutes and the burning zone approaches the top of the fire bricks. Charcoal should heap up over the top of the smelter and be added whenever the level drops to even with the top edge. Note that this consumption of fuel should remain relatively constant throughout the remainder of the smelt. This is the method used to determine changes in air flow or rate of adding ore charges. At this point the first 'seed charge' of roughly .5 lbs /.22 kg is added by sprinkling evenly over top. This should be repeated with every fuel charge for about the next four buckets. About one hour into the main sequences, the smelter should 'take off' with consumption rates rapidly increasing. The consumption rate can be stabilized by increasing the amount of ore added per fuel charge to maintain the consumption times, typically increasing by .5 lb / .22 kg amounts. Normally the consumption rate will peak with weight of ore charges equaling the weight of the standard charcoal charge. The rate and volume of slag created will vary due to ore type, and a balance must be made between maintaining a bowl of liquid slag, and not 'drowning' the tuyere. Tapping is done by removing the brick blocking the tap arch, then digging away the loose material to expose the bottom of the slag bowl. Typically a rod is used to pierce the solid bowl through to the liquid slag above. The quality of the slag can be expected to vary over the course of the smelt. Early slag tends to be viscous, light and bubbly, and a greenish colour. Discard this material. Later slag will be quite fluid, solid, and a black colour. Returning this iron rich slag to the top of the smelter effectively recycles iron still embedded in the slag into the growing bloom. If there is a large volume of slag, but it is too viscous to easily run, a small amount of hammer scale can be added with the charges. How long the sequence of adding ore charges should continue will depend on just how large a metallic bloom is desired. The EconoNorse Smelter has successfully produced blooms as small as 3 kg / 7 lbs and as large as 15 kg / 35 lbs, with 7 - 8 kg / 15 - 18 lbs being common. Eventually there will be no further room left below the tuyere for any additional bloom, generally 5 to 6 hours into the smelt. At this point both addition of ore and further charcoal is stopped, and the remaining charcoal be allowed to burn down to close to tuyere level. This phase typically takes 30 - 40 minutes. At this point the bloom mass can be extracted via the tap arch, out of the top of the smelter, or (easiest with brick construction) by simply tearing the walls down. Primary consolidation of the white hot bloom can be undertaken using the residual heat of smelting. If care is taken with dismantling the smelter, it now can be operated as a large forge for further compression of the bloom mass. Typically the original foot ball shape of the bloom is hammered to a hockey puck - a shape found with artifact blooms. Ideally the resulting metal mass should be sectioned with a hot cut (or axe) into pieces small enough to be transferred to the forge for compressing into working bars. Exact carbon content of the resulting metal is related to a large number of variables over the smelting sequence! Generally, if the furnace is allowed to run too hot, there is a good chance that liquid cast iron will be the result. “"Smelting iron is extremely dangerous. It involves very high levels of heat and potentially toxic materials. Do NOT attempt this without suitable precautions."